As we look ahead to what 2017 may hold, I’m predicting the end of what I call “the great experiment”—the managed economy that has dominated the fiscal and economic landscape for nearly ten years. The reason, as we state in the Astor Outlook 2017 Report, is not political. Rather, it’s time! Given where we are in the state of the U.S. economy and the stock market, it’s hard to believe that the great recession of 2008 (the worst economic downturn since the Great Depression) occurred nearly a decade ago. And who needs reminding of the bear market that lasted nearly a year and a half, from October 2007 to the March 2009 low? During that time the S&P 500 lost about 50% of its value. Acknowledging that investors could not endure another 30-50% decline in stocks, housing, or general risk assets, central bankers embarked on a managed economy that “cut off the tails.” That is, the downside was limited by Fed intervention, quantitative easing (QE), and regulation, while the upside was capped in exchange. And thus began “the great experiment of the managed economy.” But now, times have changed. Although the Dow reached the 20,000 level on January 25, 2017, there are even more important numbers; among them an unemployment rate below 5% and an advancing GDP rate (the final reading for Q3 2016 was 3.5%, up from earlier estimates for the quarter of 3.2% and 2.9%.). 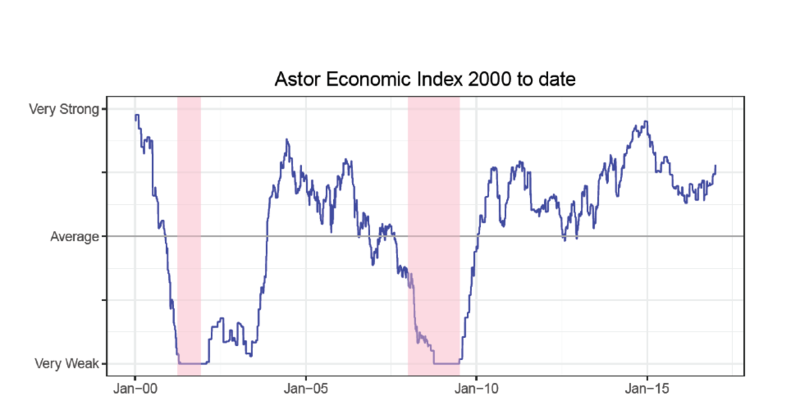 Our proprietary Astor Economic Index® (AEI) shows improving U.S. economic fundamentals that we believe are supportive of investors holding higher levels of risk assets, such as equities. This economic “now-cast” is further supported by the fact that the Federal Reserve’s December rate hike was well received (in addition to being much anticipated). The Fed said it intends to raise rates three times in 2017, up from its earlier plan of two rate hikes. The rate actions, to paraphrase Fed Chair Janet Yellen, are an endorsement of the health of the economy. To our way of thinking, we expect to see the central bank and Washington loosening their grips on the reins of managing the economy. What does that mean for equities, fixed income, inflation, commodity prices, and more? The S&P 500 Index is an unmanaged composite of 500 large capitalization companies. S&P 500 is a registered trademark of McGraw-Hill, Inc. An investment cannot be made directly into an index.